Wearing a kilt for many people, myself included, is the most natural thing in the world. But for others they perhaps find it difficult, to pluck up the courage to wear a kilt in public. After all isn't it traditional, not to wear underwear beneath it? What you wear under your kilt is entirely up to you, so please don't let anyone else tell you what is correct, do what feels most comfortable for you. So what are the benefits of wearing a kilt? The first one that springs to mind, is the fact that a kilt will get you noticed no matter where you happen to be wearing it. Now I consider that a benefit, as I like to be noticed, but there are of course people who are more comfortable blending slightly into the background. Now the Gentleman in the photo below is certainly not trying to blend into the background. men in kilts, very attractive. If you need proof of that fact, just have look at the photo below. 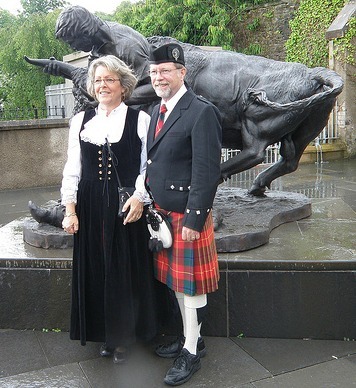 It shows a man wearing a hand made kilt, not in tartan but in a camouflage design, standing with his very attractive wife. She obviously finds her kilt wearing husband very attractive also, and she herself is a fan of Scottish tartan, as she is wearing a Black Watch Tartan cloak. And quite honestly from a health point of view, a kilt is a much more sensible garment to wear than a pair of tight fitting trousers, ask any doctor about male infertility problems. A kilt can be worn to almost any occasion, making it one of the most versatile garments available, and when you add to that the family or clan association that the tartan provides, then you have a garment being worn with great pride. A good example of this can be seen in the next photo. 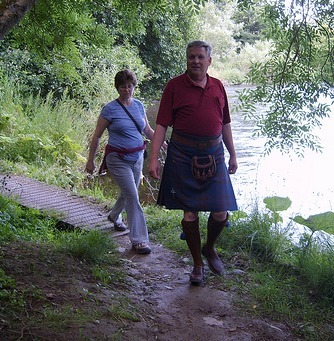 It shows a husband and wife enjoying the riverside walk between Hawick and Hornshole. This walk forms part of the Border Abbeys Way. They came to Scotland from Washington DC, to visit the ancestral lands of the clan Elliot, their family name. And as you can see he is wearing a kilt in the clan Elliot tartan. For Scotsmen there is also a very special reason why wearing a kilt is important, and that is that the English tried to ban it. After the Battle of Culloden, the English Government of the day were so afraid of further uprisings by the Scottish Highlanders, that they banned the wearing of kilts, and all tartans. This ban was to remain in force for thirty six years, during that time the kilt was only allowed to be worn by the Scottish Regiments, so we have the military to thank for the survival of the world's most famous National Dress. 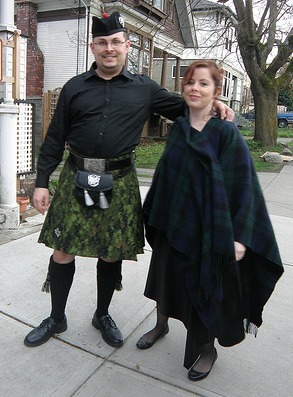 I personally have owned my kilt for fifteen years, and it looks as good today as it did the day I bought it. And while I don't wear it every day, I don't have any other outfit in my wardrobe which never goes out of fashion. I fully expect it to last my lifetime, and to be able to pass it on to my son, who at the time of writing this page, is seven weeks old. Wearing a kilt is also a good way to meet and make new friends. I have lost count of the number of strangers who have come up to me while I have been wearing my kilt, and started a conversation. I'm sure these people wouldn't have been so inclined to break the ice if I had been wearing a lounge suit. When was the last time a total stranger asked you about the outfit you were wearing? So all in all wearing a kilt is not only fashionable, healthy, and versatile, puts you in touch with your heritage, is attractive to women, and it can inspire total strangers to strike up a conversation with you. Can you think of any other garment that can do all that? I can't. So it is little wonder that the kilt in all it's various forms is so popular, and that every day more and more of you are putting one on for the very first time.